What do you mean by women empowerment? It does not mean creating a space for yourself in everybody’s heart that a women is capable of for that matter respected for. Women have far more tolerance power than men. They never say no and perform their daily duties without cribbing & getting tired and all their sacrifices just get unnoticed and in vain that’s the pain every women goes through daily. She faces more challenging life, situations, adjustments, compromises & health issues. Still she lives more, breathes more, makes her family smile and grow with each passing day. A woman lives 6 years more longer than a man. They die more of chronic diseases, heart diseases, cancer, depression, anxiety, stress, arthritis, loneliness, osteoporosis, reproductive health issues or ovarian cancers. There is a need to spread awareness & for right to every women to live for herself and get total health check-ups done so that symptoms of ill-health and various dangerous complications going on internally & externally which drain the mind, body & soul are gauged as early as possible. She also has equal rights to fight & live for her own empowerment & not curb her desires and freedom at any cost. Women also get diabetes if they are over weight. They should watch what they eat as diabetes is a silent killer. A woman has to be real strong to bear it all and should treat herself well and also know how to enjoy & indulge limitfully & controlfully. She crosses rocks & hurdles and never tires, only struggles. She should rise higher with her dreams & ambitions been seen in the positive light and no negative shadows surround her and make her uneasy and choke her breathing and that’s how she falls trap to diseases when she suppresses the deepest sorrow & grief and contains within her heart, holds all the negative energies bestowing & showering happiness to other. So a woman should be spiritually active, positive, independent & should know her body & mind with no panic but peace inside her residing every second. BE MENTALLY SOUND, FIGHT BACK WITH COURAGE AND HAVE THE STRENGTH TO MAKE THE IMPOSSIBLE, POSSIBLE. 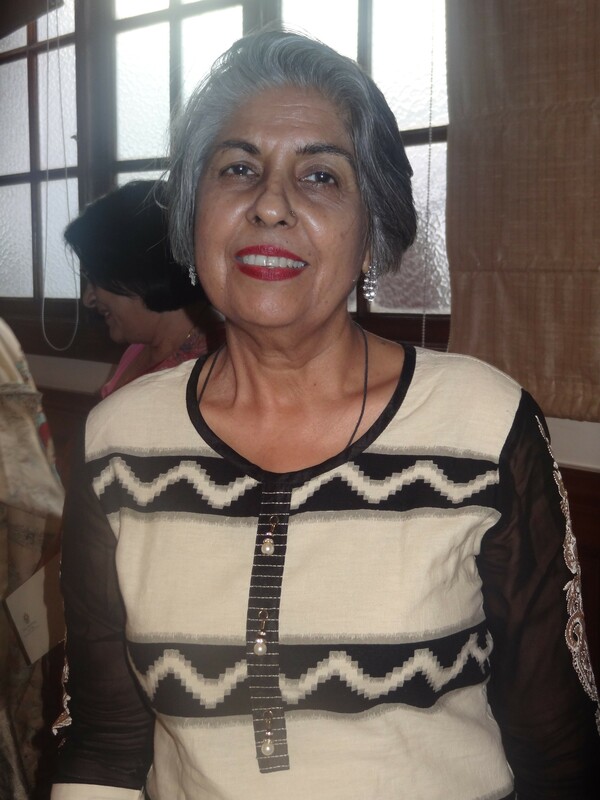 These inspiring words by Ms. Joita Soni (a Courageous Cancer Survivor for several times, a fighter and Roko Cancer’s Le’ Flamingo club member) echoed at Emily Eden & Hodges– the venue to celebrate the occasion of International Women’s Day at The Imperial New Delhi. Her story educated and reminded all the women present that how special they are in their own right fighting back emotions and staying positive even in the hour of extreme distress. 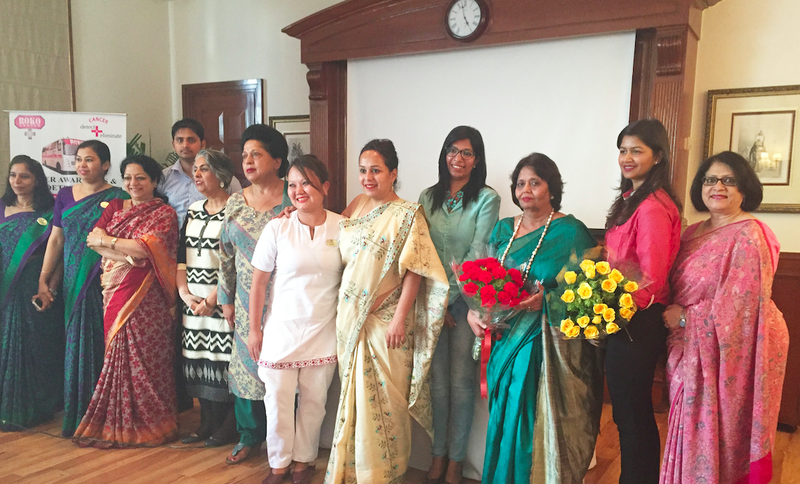 Ms. Soni a chief guest for the lovely afternoon of International Women’s day at The Imperial with Roko Cancer Charitable trust enlightened the women associates at The Imperial Ladies’ Club along with guests from media. She talked about the strength and power of a woman to fight back all odds, understanding the importance of their existence, in the life of their loved ones. While talking about her hard to believe survival journey and fighting back cancer again and again, she went down memory lane sharing her most difficult decision “ I will not feel sorry for myself for what I am going though “. She shared a strong message on the occasion “Stop being a pleaser to others, negating your own self. This leads to storing of emotions against the rhythm of your body, developing into negative harmones which are eventually released in the form of diseases. Be spiritually awake and stay happy for your own self first !” Ms. Soni’s medical journey left everyone in tears and her courage and grit filled the women with utter inspiration. Joita indeed is a pillar of hope. She fought the dreadful disease twice and lost all her long hair but still holds the best life. With the anguish & pain in her eyes & heart she fought with universe & she is being re-incarnated as she beat the disease and treasures this beautiful life by taking care of her own health & meditating daily not losing hope and appreciating & finding love in small things in life be it cartoons or Brahma Kumari sessions of positive influences or books or maybe cooking. She got total family support & encouragement which in turn strengthened her courage, fight & determination to win over this disease called cancer. She came out of depression & fought harder, turned the despair into hope & accepted the beautiful life with all her heart to stay pure, healthy & follow the doctor’s advice everyday and when the time is not right. She set a positive flow & a healthy rhythm of her great human life and set an example for others to follow and live a sane life taking proper care of herself and her beautiful peaceful life without any aggression, anger or negativity or any bad emotion or habit which brings bad thoughts. 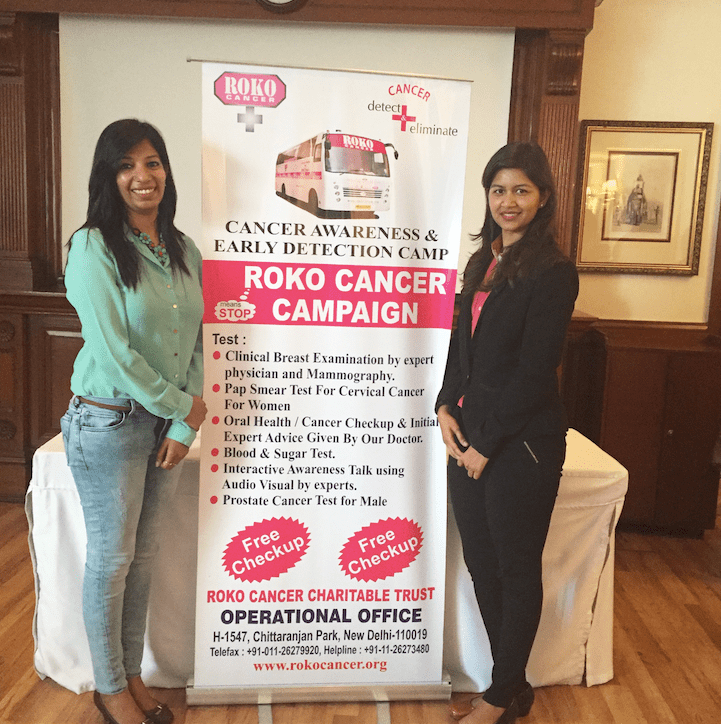 The event also featured a session on importance of healthy living for women by Dr. Sakshi Sharma – Senior Manager- Projects and Health Planning Roko Cancer Charitable trust, initiating the relevance of being an alert and aware healthy woman. Dr. Neha Garg – Manager Projects and Health Planning Roko Cancer Charitable trust had organized a special 20 minute meditation session to culminate the evening with peace and relaxation for all. The heavenly souls of universe handed a red rose bouquet to Joita, the graceful fighter & she spoke about the power of meditation, relaxation and the chant “Nam Myo Ho Renge Kyo” connecting yourself with universe, examining yourself, your body & health every now & then for early detection & reducing future stress & sorrows and the gift you have is time, use it wisely. Thank god for every little happiness, stay peaceful, pray & chant regularly and enjoy whole-heartedly & live your dreams & aspirations. Nice initiative. I am seeing an uprise in cancer cases with time. That is alarming!